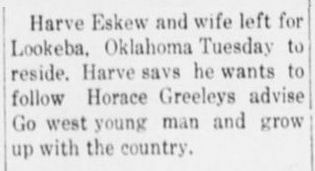 Harvey Eskew and wife left for Lookeba, Oklahoma Tuesday to reside. Harve says he wants to follow Horace Greeleys advise. Go west young man and grow up with the country. Source: Crittenden Record-Press. (Marion, Ky.) 1909-1918, December 3, 1914, Image 5 - Chronicling America - The Library of Congress. 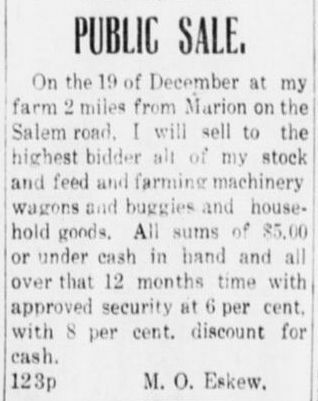 On the 19 of December at my farm 2 miles from Marion on the Salem road, I will sell to the highest bidder all of my stock and feed and farming machinery wagons and buggies and household goods. All sums of $5.00 or under cash in hand and all over that 12 months time with approved security at 6 per cent. with 8 per cent. discount for cash. Source: Crittenden Record-Press. (Marion, Ky.) 1909-1918, December 3, 1914, Image 8 - Chronicling America - The Library of Congress. Source: Crittenden Record-Press. (Marion, Ky.) 1909-1918, September 2, 1915, Image 8 - Chronicling America - The Library of Congress. Fire destroyed the old Adams shop on north College street, Monday night at 7 o'clock. It was owned by Oscar Eskew, who had no insurance. 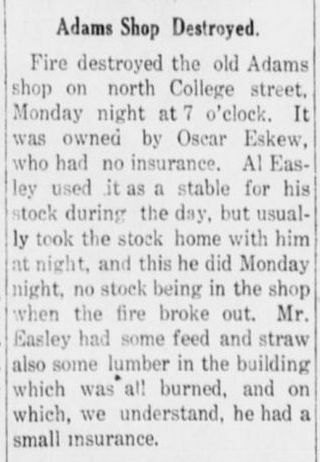 Al Easley used it as a stable for his stock during the day, but usually took the stock home with him at night, and this he did Monday night, no stock being in the shop when the fire broke out. Mr. Easley had some feed and straw also some lumber in the building which was all burned, and on which, we understand, he had a small insurance. Source: Crittenden Record-Press. (Marion, Ky.) 1909-1918, October 14, 1915, Image 4 - Chronicling America - The Library of Congress. O'Donnell Steam Heating Co., Plf. JOHN ESKEW AND ANDREW ESKEW, Dft. 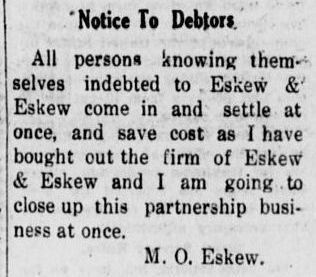 Partners doing business under the firm name of Eskew Bros.
One note for $200.00 dated Dec. 9th, 1913, and due ninety days; one note for $200.00 dated Aug. 18th, 1913, due June 9th, 1914; one note for $200.00 dated Aug. 18th, 1913, due Dec. 9th, 1914; one note for $200.00 dated Aug. 18th, 1913, and due June 9th, 1915. These notes are secured by a mortgage on a tract of land in Caldwell county, Ky., on the waters of Donaldson creek and containing __ acres being the same land conveyed to T. D. Chambliss by T. H. McGough by deed dated Jan. 18th, 1905, recorded in deed book No. 25, page 24, Caldwell county court clerk's office. Source: Crittenden Record-Press. (Marion, Ky.) 1909-1918, November 11, 1915, Image 4 - Chronicling America - The Library of Congress. 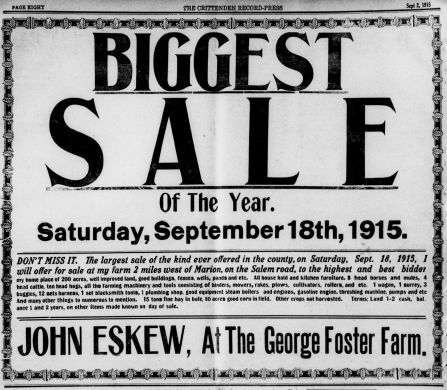 Well Known Capitalist Buys The Eskew Farm. Two deals were consumated [sic] last week which we think are of vast importance to Crittenden county and her farmers. One was the purchase by Sam Gugenheiem [sic], the well-known merchant, of the Eskew farm of 200 acres, 2 miles west of Marion, on the Salem road, and the second was the leasing of said farm to J. Robt. Bird, the county farm demonstrator, who will make a demonstration farm out of it and endeavor to show our Crittenden county farmers by new methods that our land can be built up and made to produce double what much of it does produce now under old methods. We regard this as a fortunate deal all around. Mr. Gugenheim having the capital which he is always willing to put into a safe proposition saw at a glance the bargain to be had in this farm under Mr. Bird's control. We look for 100 per cent. enhancement in this property within a couple of years. Source: Crittenden Record-Press. (Marion, Ky.) 1909-1918, December 9, 1915, Image 4 - Chronicling America - The Library of Congress. 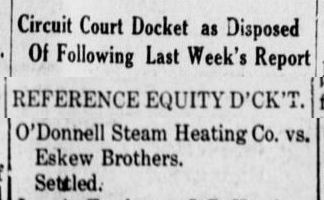 O'Donnell Steam Heating Co. vs. Eskew Brothers. Source: Crittenden Record-Press. (Marion, Ky.) 1909-1918, March 30, 1916, Image 5 - Chronicling America - The Library of Congress. Mrs. Oscar Eskew is in a serious condition at her home here. 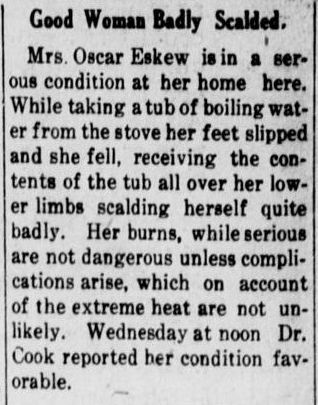 While taking a tub of boiling water from the stove her feet slipped and she fell, receiving the contents of the tub all over her lower limbs scalding herself quite badly. Her burns, while serious are not dangerous unless complications arise, which on account of the extreme heat are not unlikely. Wednesday at noon Dr. Cook reported her condition favorable. Source: Crittenden Record-Press. (Marion, Ky.) 1909-1918, July 20, 1916, Image 1 - Chronicling America - The Library of Congress. 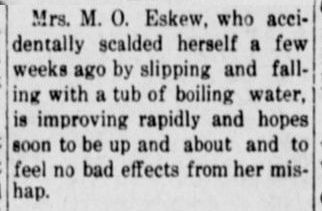 Mrs. M. O. Eskew, who accidentally scalded herself a few weeks ago by slipping and falling with a tub of boiling water, is improving rapidly and hopes soon to be up and about and to feel no bad effects from her mishap. Source: Crittenden Record-Press. (Marion, Ky.) 1909-1918, August 3, 1916, Image 5 - Chronicling America - The Library of Congress. 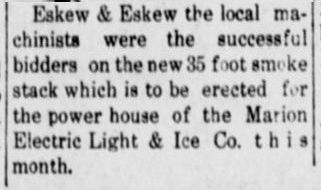 Eskew & Eskew the local machinists were the successful bidders on the new 35 foot smoke stack which is to be erected for the power house of the Marion Electric Light & Ice Co. this month. Source: Crittenden Record-Press. (Marion, Ky.) 1909-1918, August 10, 1916, Image 5 - Chronicling America - The Library of Congress. John Eskew who has been in poor health has returned from Sikeston, Mo. Source: Crittenden Record-Press. (Marion, Ky.) 1909-1918, October 5, 1916, Image 5 - Chronicling America - The Library of Congress. 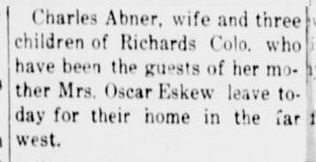 Charles Abner, wife and three children of Richards Colo. who have been the guests of her mother Mrs. Oscar Eskew leave today for their home in the far west. Source: Crittenden Record-Press. (Marion, Ky.) 1909-1918, July 19, 1917, Image 5 - Chronicling America - The Library of Congress. Joe Hobson has sold his house and lot to John Eskew, who will occupy it as a home. 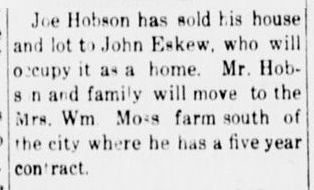 Mr. Hobson and family will move to the Mrs. Wm. Moss farm south of the city where he has a five year contract. Source: Crittenden Record-Press. (Marion, Ky.) 1909-1918, December 6, 1917, Image 5 - Chronicling America - The Library of Congress. At the home of Mr. and Mrs. M. O. Eskew on Feb. 15th. 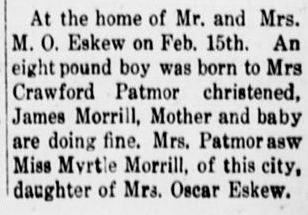 An eight pound boy was born to Mrs. Crawford Patmor christened, James Morrill. Mother and baby are doing fine. Mrs. Patmor was Miss Myrtle Morrill, of this city, daughter of Mrs. Oscar Eskew. Source: Crittenden Record-Press. (Marion, Ky.) 1909-1918, February 28, 1918, Image 1 - Chronicling America - The Library of Congress. 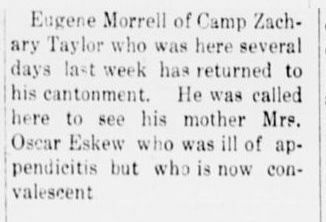 Eugene Morrell [Morrill] of Camp Zachary Taylor who was here several days last week has returned to his cantonment. He was called here to see his mother Mrs. Oscar Eskew who was ill of appendicitis but who is now convalescent. Source: Crittenden Record-Press. (Marion, Ky.) 1909-1918, March 28, 1918, Image 5 - Chronicling America - The Library of Congress. Billy Eskew was painfully burned last week when a popcorn popper he was operating exploded, blistering his face in several places pretty severely. The accident came near causing him to lose an eye. 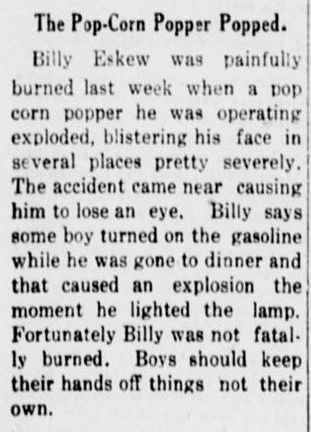 Billy says some boy turned on the gasoline while he was gone to dinner and that caused an explosion the moment he lighted the lamp. Fortunately Billy was not fatally burned. Boys should keep their hands off things not their own. Source: Crittenden Record-Press. (Marion, Ky.) 1909-1918, June 6, 1918, Image 8 - Chronicling America - The Library of Congress. Oscar Eskew and wife visited Crawford Patmor and family Sunday. Source: Crittenden Record-Press. (Marion, Ky.) 1909-1918, July 4, 1918, Image 7 - Chronicling America - The Library of Congress. All persons knowing themselves indebted to Eskew & Eskew come in and settle at once, and save cost as I have bought out the firm of Eskew & Eskew and I am going to close up this partnership business at once. Source: Crittenden Record-Press. (Marion, Ky.) 1909-1918, July 18, 1918, Image 1 - Chronicling America - The Library of Congress. Assessor W. K. Powell has rented the Andrew Eskew property and will move to it soon. Source: Crittenden Record-Press. (Marion, Ky.) 1909-1918, August 8, 1918, Image 5 - Chronicling America - The Library of Congress. 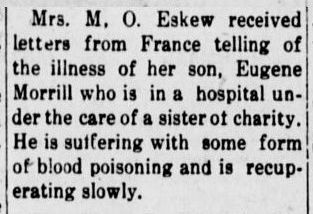 Mrs. M. O. Eskew received letters from France telling of the illness of her son, Eugene Morrill who is in a hospital under the care of a sister of charity. He is suffering with some form of blood poisoning and is recuperating slowly.